I am turning a new leaf. Mint is a whole new leaf to me. Ok, technically it is an herb. But really, it looks like a pretty green leaf and honestly I do not like to get technical around here anyway. I know that a lot people love mint. I was never one of those people. Until now, of course. Growing up, my Mimi and Papa (Dad’s mom and dad) belonged to this country club, Westwood. If you happen to live in Ohio along Lake Erie in Bay Village, Rocky River, Lakewood or really anywhere along the west side of Cleveland, than you probably know what I am talking about. It’s a typical country club with a golf course, tennis courts, pool, snack bar, club house and formal dinning area. This is all great if your family is country club suitable. Mine is most definitely not. Like in any way shape or form. My family, and by family I mean my immediate family, two parents, six siblings and me. Yeah, the nine of us? We’re the hillbillies. Seriously not even exaggerating. We’re the trouble makers, the rule breakers, the always late ones, the ones that show up in jeans to a coat and tie event, the loud ones (ahem, Creighton), the improper eaters. Basically, the embarrassing ones. That’s my family. Want to come meet us? We’re pretty fun! Westwood always had those chocolate covered mint candies lying around in little bowls. Like they were everywhere. It was pure torture. Every time I would see a bowl I’d grab one, bite in and be so disappointed. Then I’d proceed to put my bitten candy back in the bowl…..
Come on, I would not do that. Or maybe, I would. No I wouldn’t. Okay, wait I probably would if they were a box of candies that were lying around my house. Yeah, then it’s fair game. So because of those stupid candies I grew up thinking I hated mint, when in reality I think I just did not like those candies. Although, I do remember stealing a few spoonfuls of my little bro’s mint chocolate chip ice cream straight from the freezer. That stuff was pretty good, but I am positive the only reason I did that was because that was my only option at the time. If given the choice between vanilla ice cream and mint chocolate chip I would always go vanilla. Ah man, now I am thinking about that new batch of ice cream in the freezer. The one I haven’t posted yet. Can’t wait to share that one with you, mmmm. Anyway, here is the deal, I saw some pretty mint in the store. Then for some reason I had the urge to buy the pretty mint. Then I made some pesto with pistachios and the said mint and fell madly and deeply in love. Not gonna lie, the manchego cheese probably helped a whole lot. Then I fried some zucchini, but not really. I crisped it in a skillet, cause you all know I hate frying. Next I put it all together and called it a meal. And now, I love mint. Especially mint with manchego cheese and pistachios. So darn good. Oh and obviously the fried zucchini. It is crispy, cheesy and so sticking good. Make the pesto. In a food processor, combine the parsley, mint, garlic and pistachios and pulse until coarsely chopped. Add the lemon juice, lemon zest, parmesan and manchego cheese. Process a few times more. Then with the food processor running stream in the olive oil and process to a puree. Season the pesto generously with salt and pepper. Set aside. Bring a large pot of salted water to a boil. Cook the pappardelle until al dente. Reserve a cup or so of the cooking water and then drain the pasta. While the pasta cooks "fry" the zucchini. In a bowl, whisk together the egg and buttermilk. In another bowl, whisk together the panko, flour, parmesan, salt and pepper. Heat a large skillet over medium heat and add olive oil. Dip each zucchini slice in the egg mixture to coat, then dredge through the breadcrumbs, pressing gently to adhere. Place in the skillet and cook until golden. This took me about 3 to 4 minutes per side. When finished, remove the slices and let drain on a paper towel. Add the pasta to a large serving bowl, or add it back to the large pot you boiled it in. Add the pesto and the a few tablespoons of the reserved water and toss well. Season with salt and pepper. 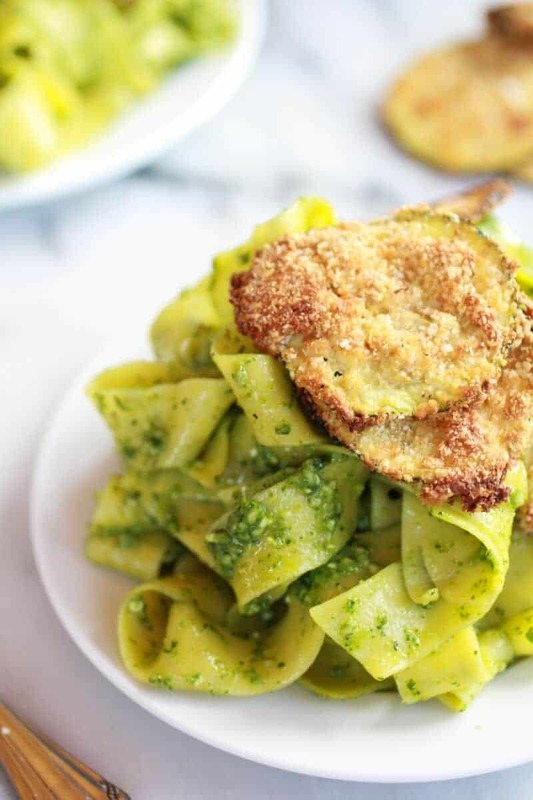 Add the fried zucchini and toss or serve the pasta and top each plate with the fried zucchini. Serve immediately and top with fresh grated machego cheese and a zest of lemon. Think you’ll love it too. YUUUUM! yum yum yum. Seriously, our family is SO “that family” too. The fact that we’re home schooled doesn’t help either, like when we’re out running errands while the rest of the world is in school… People think we’re ditching. Oh yay! So happy my family is not the only hillbillies out there!! Haha! Thanks so much, Sophie! Oh and FYI, my youngest brother is home schooled so he can go and snowboard all day long! It is pure craziness! Your new leaf rocks! 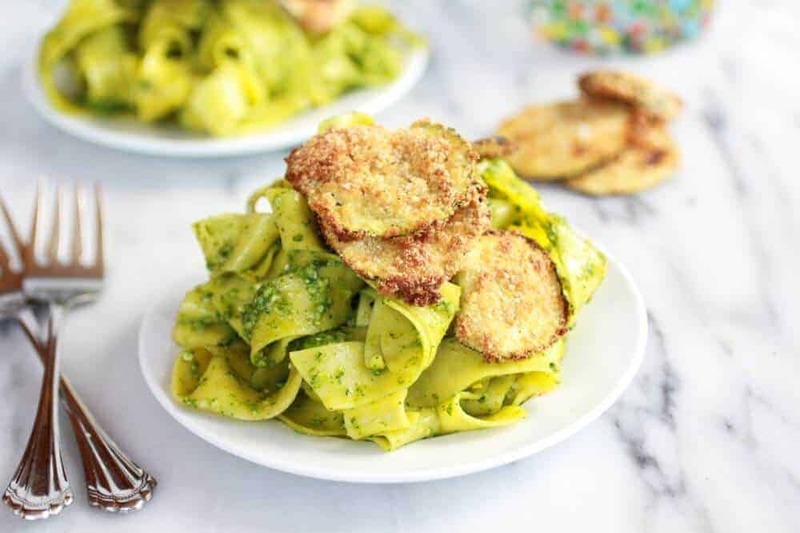 I love mint and all fresh herbs, so your pasta is looking mighty refreshing to me! Haha! Thanks so much, Julia! I love my new leaf too! Umm… yeah, the fried zucchini? It rules!! LOL! 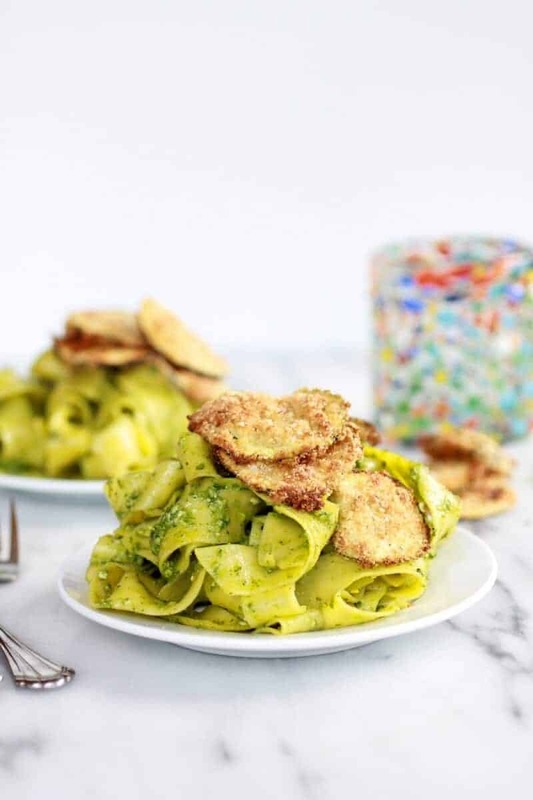 This pasta sounds pretty incredible – so bright and fresh! Thank you so much, Kathryn!! I am so happy you like it and so happy to see your comment! Yay! 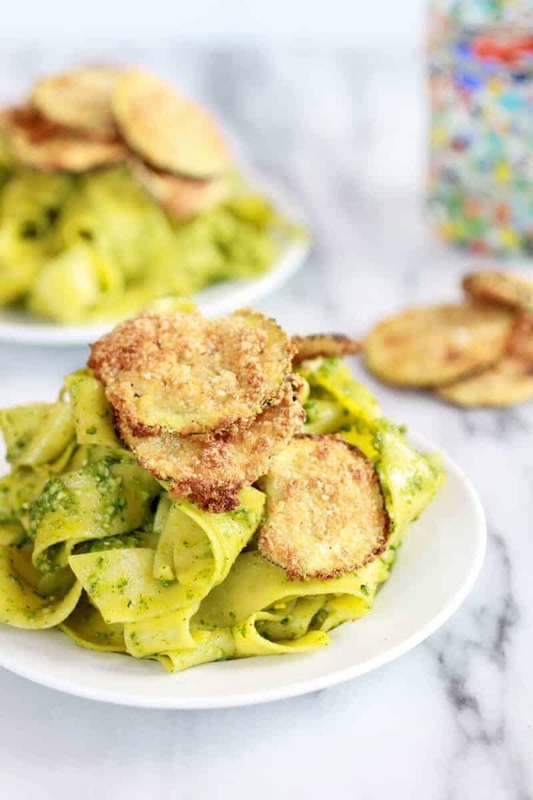 Your mint pesto sounds incrdibly interesting! Again – so unique! As always – lovely pictures! Thank you so much, Shashi! Your comments are always so nice! Haha! Yeah, honestly the mint is really subtle in this. I think all the cheese helps!! It is a good place to start! Oh, Tieghan. 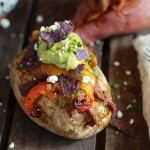 This looks like the most delicious summer comfort food! 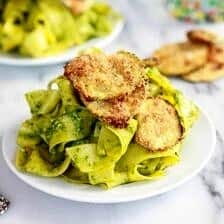 I love papardelle! 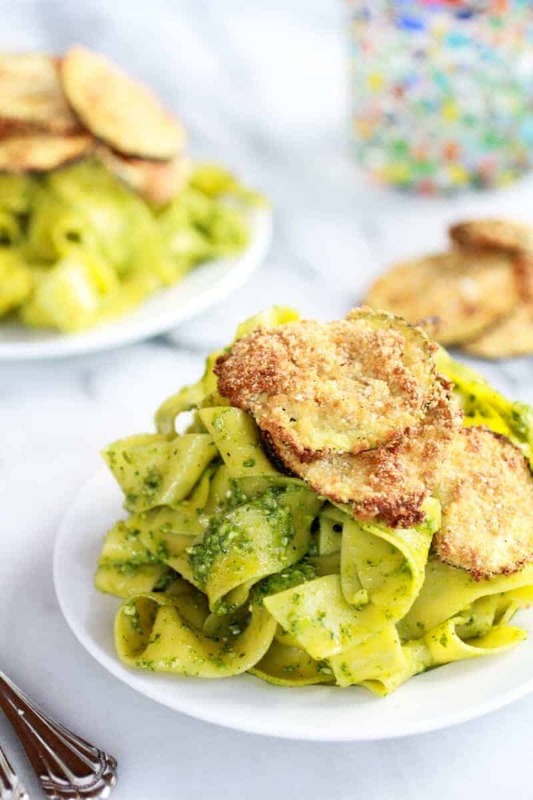 There’s something so sensuous about those thick ribbons of pasta, and swirled with a pistachio pesto I bet they taste better than any way I’ve ever eaten them! Amazing recipe, darlin! Awe, thank you!! The pasta really is so good. I love the thick ribbons and the pistachios too! But, everyone else in my life enjoys it, so I don’t mind cooking with it – plus I won’t be tempted to indulge! 🙂 This looks so beautiful! You are too nice! Cooking with things your don’t like just for other people! Wow! Ooh! 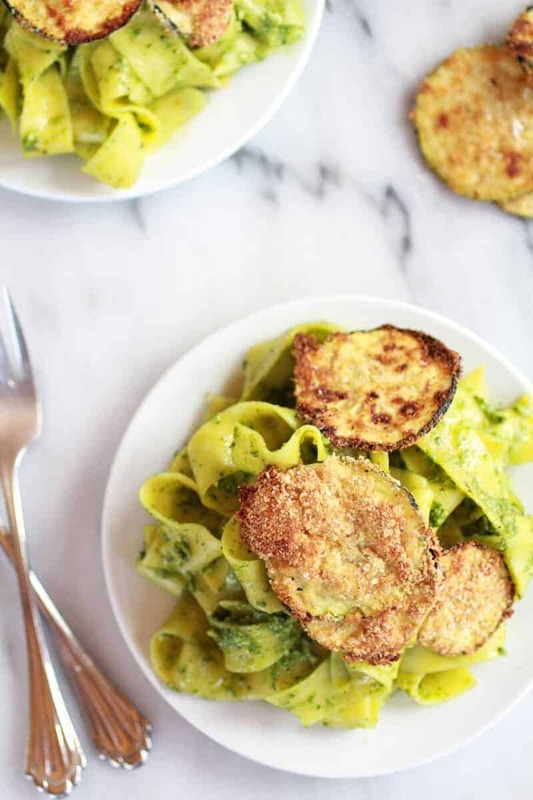 Loving the texture of soft noodles with fried zucchini! It is so good! Thanks Steph! Wow! I love fried zucchini and you just took it to a level beyond deliciousness!!! Thank so much, Robyn! The fried zucchini is so good! Mint anything is my jam, but WHOA, this dish is just… well, WHOA! Haha! Thanks so much, Ashley! That fried zucchini sounds and looks SO good!! It reminds me of fried pickles! 🙂 I think that I might try to make a baked version. I have done both the oven and skillet version. Both work great!! Thanks Hannah! Where’s my fork, I’m ready to twirl! Hehe! Thank you so much, Paula!! And thank you for including me in your parade article today!! So excited! Thanks! 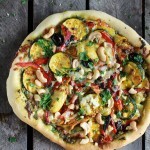 I tried this zucchini last week, it is so tasty! It is so good, right?!? Thanks Kelly! That’s funny but I get it. You never know what will cause a taste bud hatred! But I love mint and this looks like a beautiful dinner. Yum! This looks awesome! What a unique combination. oooh, what gorgeous shots. And the mint, cheese, pistachio combo sounds so interesting. 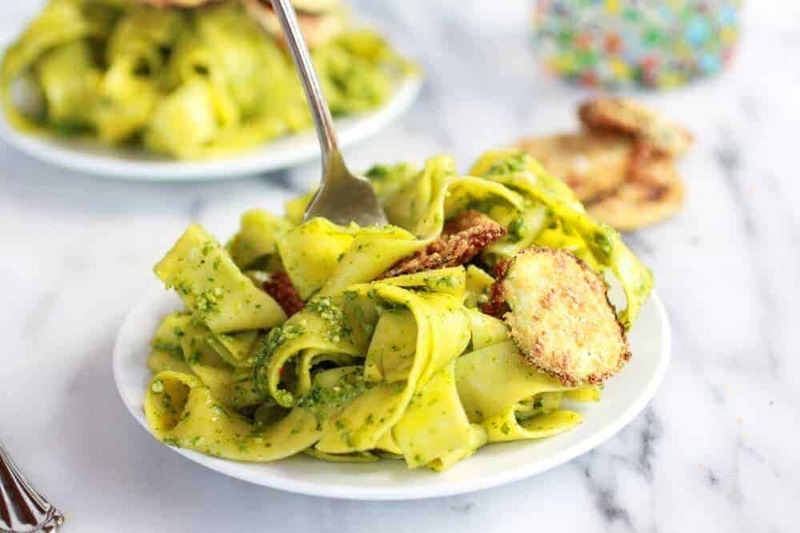 Your Pappardelle pasta looks so beautiful in these pictures, loving that mint pesto! I usually make basil or kale pesto, but never mint.. going to pick some and give it a try, can’t wait! Yay! Hope you love this, Pamela! Let me know what you think! Thanks! It’s funny that you “think” I’ll love this when really I am ridiculously obsessed with it. 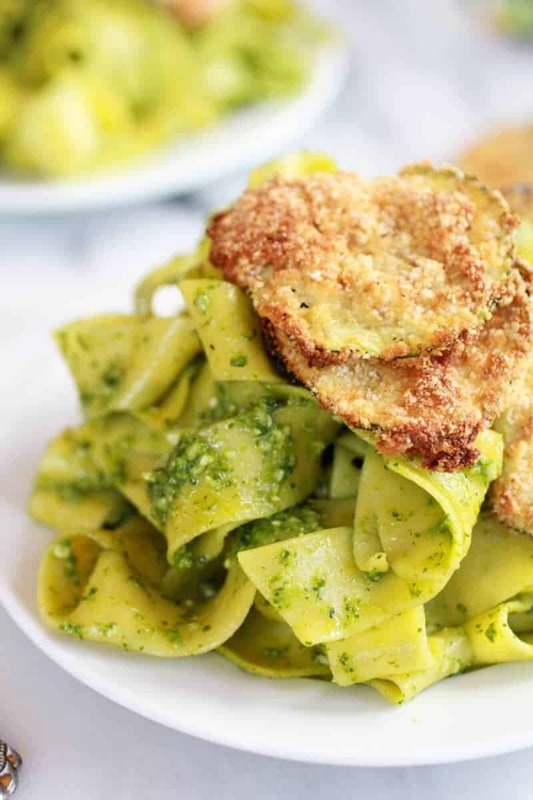 Pesto is like, my blood type. 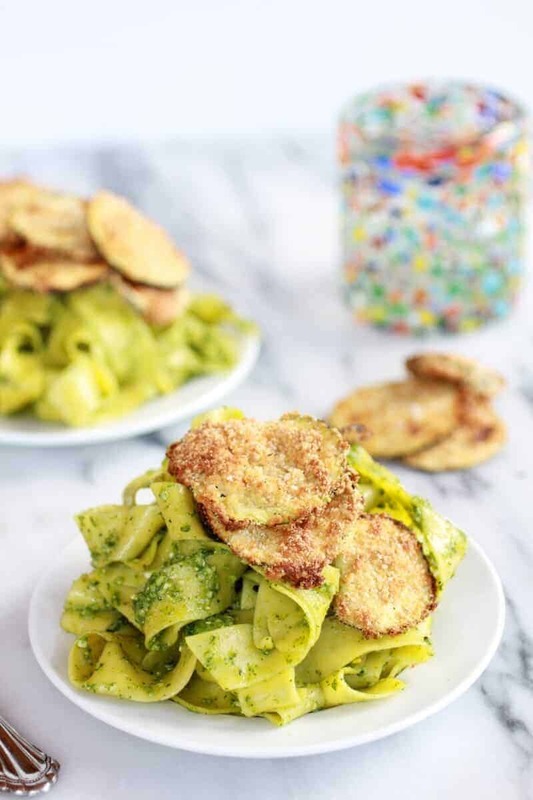 And I love pistachios and zukes and anything pasta-y or faux-fried.. basically this dish is my like food spirit animal. YES!! So happy to please you, Hayley!! LOL! Woah this is SOOO my kinda meal!!! Just bought mint for a mojito, but this will work too..haha LOVE this! Thank you so much, Samantha! Hope you have enough for both the mojito and the pasta! I bet the would be good together! I have always loved mint. 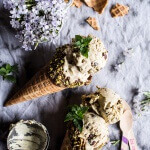 We have had mint plants growing in our yard since I was little, and I used to pull of the leaves and eat them plain 🙂 This looks amazing and brings back memories! 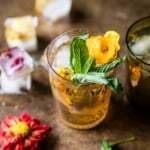 Mint plants in your backyard? that sounds awesome!! I just got a giant zucchini (Zucchini-Zilla) and need to find creative ways to cook it. Found you over at What’s Cookin’ Wednesdsay. I am co-hosting Tasty Tuesdays this week and would love for you to link up this recipe. I don’t see buttermilk in the ingredients list but it calls forit in the description for the zucchini. How much is needed? Can’t wait to try this tonight, so much mint in my garden! Thank you! Yu just need 1/2 cup. Sorry about that and I hope you love this!! Hi, I absolutely love your blog! I love your family stories! I used to be a kitchen hater, but I have been inspired by your page. Little by little I have been trying out your recipes. Tomorrow I would love to prepare this one for my friends, but I have a doubt: In the country I live in, buttermilk does not exist, so I do not know how it is. I have googled and the solution is to make a substitute but there are two types. Can you tell me which one it is? 1. LIQUID: by mixing a cup of milk with 20ml of lemon juice (in case the butter milk you use is liquid). 2. If buttermilk is more dense, the mix should be half cup of natural yogurt + half cup of milk and add 20 ml of lemon juice. In both cases you need to leave this to rest for 10-15 minutes.